Are you ambitious, talented and looking to fast-forward your management career? We are offering a limited number of positions to enter our 18-month global managemet trainee program. We seek individuals with management potential and a commercial mindset. Our goal is that you will move into a senior manager role or manage one of our Key Accounts. The ISS Global Management Trainee Program offers a large degree of flexibility, so what kind of management role you end up with is based on your motivation and skills. Successful applicants will join our pipeline of managers across the world who will lead the transformation of ISS. Starting in September 2019, our intensive program provide you with an excellent understanding and insight within operations, customer partnerships, strategy and leardership. During the program, you will go through a three- month international placement where you will worke on a global key account and get to know a different culture and business-mindset. You will also present your work for the national management team. Once you have completed the 18-month programme, our aim is to offer you a management position that fits your skills and preferences. ISS is a people organization, so to succeed it is important that you can identify yourselves with our company culture, values and vision. We are going to be the world’s greatest service organization; we are looking for young professionals that can tribute to this goal. As a person, you enjoy a complex challenge and demonstrate the right analytical skills to support the further development of ISS and our services. You need to have a good business understanding to be able to meet the customer needs and increase business margins. Your ambitious mindset is balanced by your respectful and empathetic attitude towards the people around you. You are also a strong communicator, in both written and spoken Norwegian and English. You will be a part of ISS Norway and, during the program, will report to head of talent development in ISS Norway. We offer good terms of employment, engaged management and attractive development possibilities. 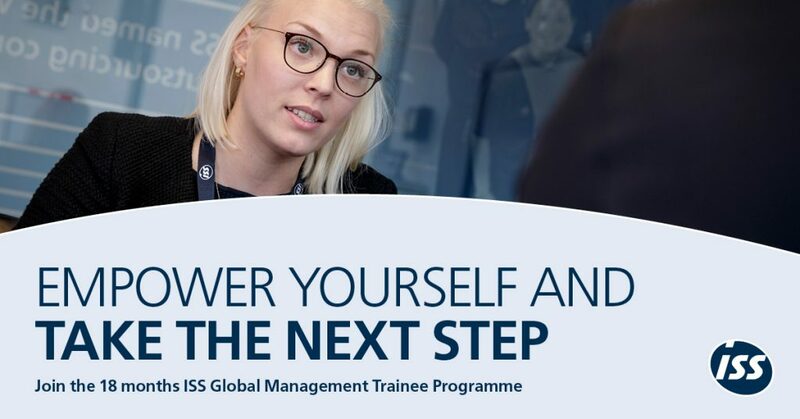 If you wish to join the ISS Global Management Trainee Program, you should prepare for an intensive recruitment process. You will meet highly professional recruitment specialists and managers, who will support your learning and personal development. The process culminates at our assessment centres in March, where our country managers and other key executives will participate as assessors. I Norge er ISS markedsleder og driver utviklingen i bransjen av både teknologi- og tjenester. Selskapet har en ambisjon om kontinuerlig organisk vekst og investeringer i vår viktigste ressurs, våre ansatte. ISS Norge leverer i dag tjenester innen eiendom, renhold, catering og kontorstøtte, både som integrerte løsninger og som enkeltstående tjenester. ISS Norge omsetter for mer enn 5 mrd. NOK og er en av Norges største arbeidsgivere med over 10.000 ansatte. Selskapet har 60 regionkontorer med hovedkontor i Oslo. Our vision: We are going to be the Worlds`s Greatest Service Organisation. Apply before 13 January 2019 by responding to this add: Here. Follow the Trainee Programme on www.trainee.issworld.com or on Instagram under the account: TRAINEES_ISSWORLD or using the #ISSTRAINEE.